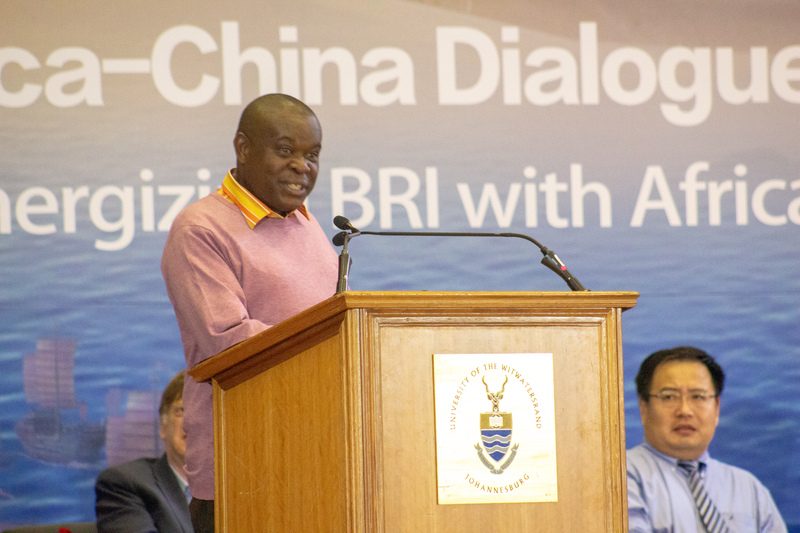 The Africa-China Reporting Project (the Project) and Wits University hosted the South Africa-China Dialogue on the Belt and Road Initiative (BRI) on 23 November 2018. The BRI is an inter-regional connectivity drive adopted by the Chinese government involving infrastructure development and investments in countries in Europe, Asia and Africa to link China and the world via maritime and terrestrial trade corridors. The conference provided an opportunity for South African media, researchers, think tanks, government and the public to engage directly with African and Chinese experts on the concept of the BRI and to consider South Africa’s potential participation in the BRI. 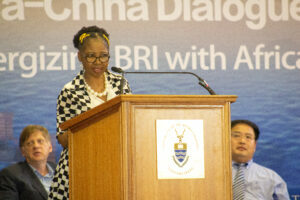 Bongiwe Tutu, Assistant Project Coordinator of the Africa-China Reporting Project, welcomed all delegates and speakers to Wits University’s first BRI conference. Wits University, she stated, is a renowned institution internationally recognized for its strong commitment to research, academic excellence, and development, and is well placed in Johannesburg to be at the core of research, teaching, training, and implementation developments of the BRI in southern Africa. With China as South Africa’s biggest trading partner and South Africa having the largest Chinese community in Africa, discussions on the BRI in South Africa are imperative, particularly in light of South Africa’s pivotal objective of addressing the triple challenges of poverty, inequality and unemployment, and in its pursuit for economic transformation. She added that Wits University, with its global partners, networks and relationships established over decades, continues to produce people who engineer meaningful change and growth in society. She informed the audience that this BRI conference is the first of a series of engagements by Wits University on the BRI, constituting an ongoing engagement with Chinese and African perspectives on the BRI. The first panel of the BRI conference, chaired by Elizabeth Sidiropolous, Chief Executive, South African Institute of International Affairs (SAIIA), featured presentations on the concept of the BRI and the implications and possibilities for South Africa. 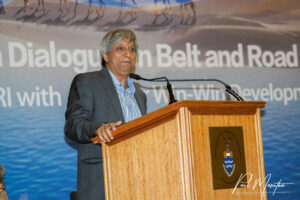 In his keynote remarks, Wits University Vice-Chancellor and Principal Professor Adam Habib began by discussing the three-week visit to China undertaken by himself and a delegation from Wits University in 2018 to explore potential partnerships in multiple fields. The delegation visited higher education institutions in China including Peking University, Tsinghua University, the Beijing Institute of Technology, Fudan University, Shanghai Jiaotong University, Tongii University, and Nanjing University. Professor Habib stated that the partnerships were being established in order to strengthen institutional relationships within the phenomenon of globalization. 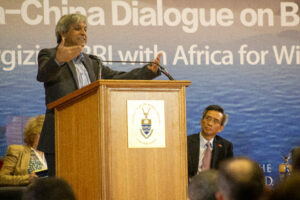 Highlighting the importance of the BRI conference from an institutional perspective, Professor Habib deliberated on the implications of the conference for the relationship between Africa and South Africa with China. The BRI is an ambitious public investment project as a result of China’s experience of economic success over the years, particularly from the late 1970s to the early 1980s. The BRI is “China’s face to the world” as China wants to expand its resources and deploy them to the rest of the world. Professor Habib stated that institutions as the legacy of fundamental change should assess the merits of partnerships, and consider what is South Africa’s agenda and if it is aligned with China’s agenda. The fundamental question for us is: Can there be a coincidence of interests between China’s agenda and African’s agenda? Because if we could make that coincidence of interests, then the possibilities of transforming our world begins to emerge. Professor Habib cautioned on super powers who exhaust the efforts of the developing world from benefiting equally in projects, as reflected in the histories of development in the global context of dual or multi-polar powers. He stated that development agendas developed in the South in the context of a uni-polar world were very rare, and that bipolar and multi-polar worlds presented more possibilities for enabling development as countries of the South are given multiple options to engage in the global order. In this way they can ensure that the engagements with bigger powers occurred on terms that were compatible with their own development objectives. Professor Habib reminded the audience that for a long time in the 1990s Africa’s engagements with parts of the West led to destructive results, with the example of the structural demands from the International Monetary Fund (IMF) and the World Bank in the 1980s that devastated higher education in Africa. In the engagements on the BRI the lessons of the past should be regarded and prevented from re-occurring. Much of the tragedies of higher education in Africa today in part lies in the failures of Western engagement in Africa on structural conditionalities of the 1980s. So when we look forward, when we begin to engage with the Belt and Road, we must start beginning to say, What are the terms, on what conditions, and how do we make sure that those terms and structural look and conditions work with and are compatible with developmental objectives of South Africa but also the rest of the continent? Professor Habib emphasized the importance of the coincidence of interests between China and Africa that can enable the development and linking up of the continent, thereby enhancing Africa’s position in the global economy. So in a sense, when people say China has an agenda when it engages with Belt and Road, my answer is yes, it does, and absolutely should. What I want to ensure as a South Africanism in Africa is to ensure that I can create the coincidence of interest so that their interests and our interests are not contradictory. In closing, Professor Habib stated that in partnering with China in the BRI and other mechanisms including BRICS and FOCAC, South Africa and Africa had to ensure that three considerations were met, i.e. firstly that the exact terms, scale, financing, and evaluation of the BRI had to be fully understood; secondly that the terms of partnerships are structured in a format that enabled inclusive development in South Africa and the rest of the continent; and thirdly that South Africa needed to learn how to implement and on scale. 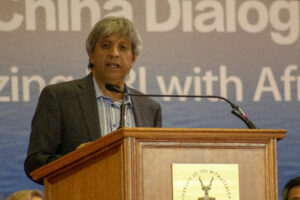 Professor Adam Habib’s full address is available here. H.E. Ambassador Lin Songtian presented his address and reflected on some of Professor Habib’s concerns on the operations of the BRI and how it could be synergized with Africa’s development. 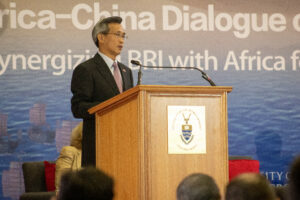 Ambassador Lin began by recognizing the relevance of the BRI conference, stating that it addressed timely the interests and concerns of the international community, particularly of the African people, and that it demonstrated the global perspective and strategic vision of Wits University, and that he anticipated fruitful exchanges contributing to better synergizing of the BRI with Africa’s developmental framework. In light of commonly shared interests, the Ambassador stated that in order to realize sustainable development and to meet the common aspirations of all peoples, governments had to take joint responsibility to uphold durable world peace. He stated that the BRI focused on economic development and did not engage in the export of politics, adding that it “aims to address bottleneck issues that restrain economic and social development to build five connectivities for common development. The BRI is committed to open cooperation and rejects protectionism. There is no geographical or ideological barriers to participate in the BRI. The Ambassador stated that the BRI belonged to the world, that any country or region was welcome to join in the BRI, as long as it agreed to follow the principle of “three togethers” and committed themselves to building “five connectivities”. According to Ambassador Lin, the BRI has been transformed in the last five years, and that 113 countries and 29 international organisations signed BRI cooperation documents with China. From 2013 to 2017 China’s imports from BRI countries amounted to US$6.97 trillion, and more than 10 China-Europe daily freight trains were running between China and Europe, thus boosting trade across regions. The Ambassador added that the two major challenges to connecting the BRI with Africa were firstly the lack of a comprehensive understanding of the BRI in Africa, and secondly Western interpretations placing emphasis on a particular narrative of a “neo-colonial China”. He concluded, however, that he trusted the judgement of Africans as their own agents. H.E. 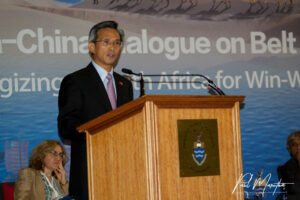 Ambassador Lin Songtian’s full address is available here. The House Chairperson of Committees at the Parliament of South Africa, Cedrick Frolick discussed the relevance of the BRI to the South African Parliament. Mr Frolick began by reflecting on the state visit of President Xi Jinping to South Africa in July 2018, a year that marked two decades of diplomatic relations between South Africa and China. 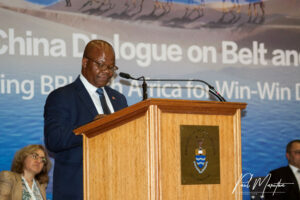 The year also witnessed the 10th annual BRICS Summit held in Johannesburg, followed by the 7th FOCAC Summit in Beijing. Mr Frolick highlighted that President Xi Jinping affirmed that the two countries had political mutual trust, practical cooperation, people-to-people exchanges and strategic coordination. Mr Frolick outlined the interest of the South African Parliament in the BRI, stating that Parliament represented the interests of the citizens to make laws, to oversee executive action and to hold the executive accountable for the implementation of the work. Since 2006 Parliament has established a formal exchange mechanism with the National People’s Congress in China, and over the years there have been regular exchanges and visits between China and South Africa in committees including trade and industry, international relations, tourism, communications, police, arts and culture, and environmental affairs which are of particular importance to the BRI. We will not have this win-win relationship if the environment is neglected, and we have many lessons to learn in this regard. 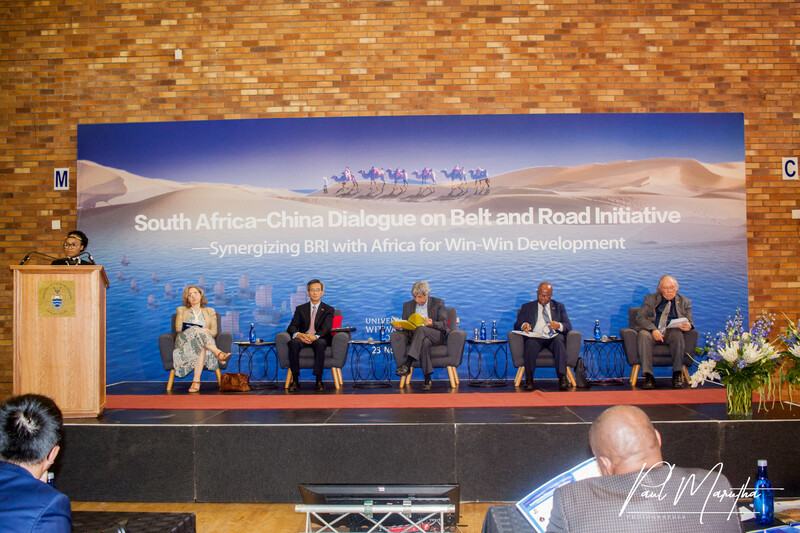 Mr Frolick highlighted to importance of the realization of the BRI as economic framework that was developed to increase connectivity in China and Africa, and specifically with South Africa, linking and bridging the different regions on the continent and China along the BRI. “There is a strong indication that many African countries are strategically situated, or are being repositioned to benefit the most from BRI,” he said. In conclusion, Mr Frolick emphasised that the BRI called for the establishment of a China-Africa legislative collaboration for ecology and economic development along the BRI. To focus on the specific provisions of climate change, water conservation, and desertification control and biodiversity protection in the FOCAC action plans that are already implemented – not to put economic development on the forefront and forget the impact of climate change. Mr Frolick identified the potential benefits of the China-Africa legislative collaboration to facilitate the sharing of best practices to environmental protection and sustainable development. House Chairperson; Committees, Parliament of South Africa, Mr Cedrick Frolick’s full address is available here. H.E. Ambassador Dr Manelisi Genge stated that the timing of the BRI conference was opportune as Africa needed more investment in infrastructure and industrialisation to reach its objectives as set out in the African Union’s Agenda 2063. Dr Genge indicated that South Africa and China signed an MoU on Jointly Building the Silk Road Economic Belt and the 21st Century Maritime Silk Road in December 2015 on the margins of the Johannesburg FOCAC Summit. This followed the MoU signed on 27 January 2015 by China and the African Union to cooperate on the development of major infrastructure networks, improving connectivity as well as industrialisation in Africa. It is estimated that total trade between China and the countries along the BRI exceeded US$3 trillion between 2014 and 2016. The US$40 billion Silk Road Fund and the US$100 billion Asian Infrastructure Investment Bank (AIIB) are being used to support the BRI, while the China Development Bank (CDB) is set to invest over US$890 billion into over 900 projects in 65 countries. The projects are aimed at building up much needed infrastructure, increase trade and finance, and boost connectivity across Asia, Africa and Europe. Noting the benefits for Africa, including expected GDP growth of Sub-Saharan Africa of US$29 trillion by 2025, Dr Genge added that further development of Africa’s economies is hampered by a lack of industrial capacity as well as massive infrastructure backlogs. To this end, Dr Genge concluded, what was imperative for Africa’s development was the continent’s role in the BRI which should be underpinned by critical areas including industrialization, infrastructure development (which includes ICT), development of Special Economic Zones (SEZs) and industrial parks, developing the energy sector, the ocean Economy, development finance, and human resources and skills development. H.E. 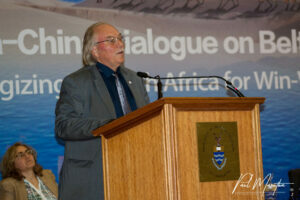 Ambassador Dr Manelisi Genge full speech is available here. According to Professor Shelton, the debate relating to South Africa’s potential participation in China’s BRI has raised three important questions. 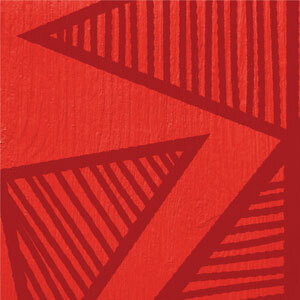 Firstly, which country is South Africa’s (and Africa’s) best development partner and why? 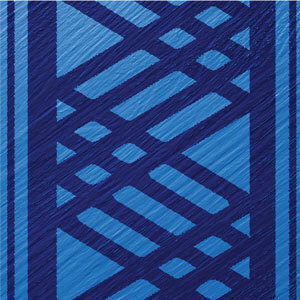 Secondly, how can the BRI assist Africa’s development? And thirdly, what is the best way forward for South Africa to engage with the BRI? 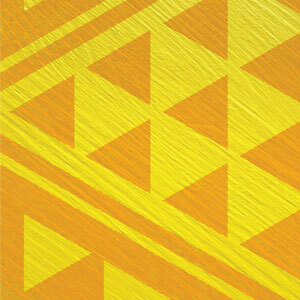 Professor Garth Shelton’s presentation is available here. 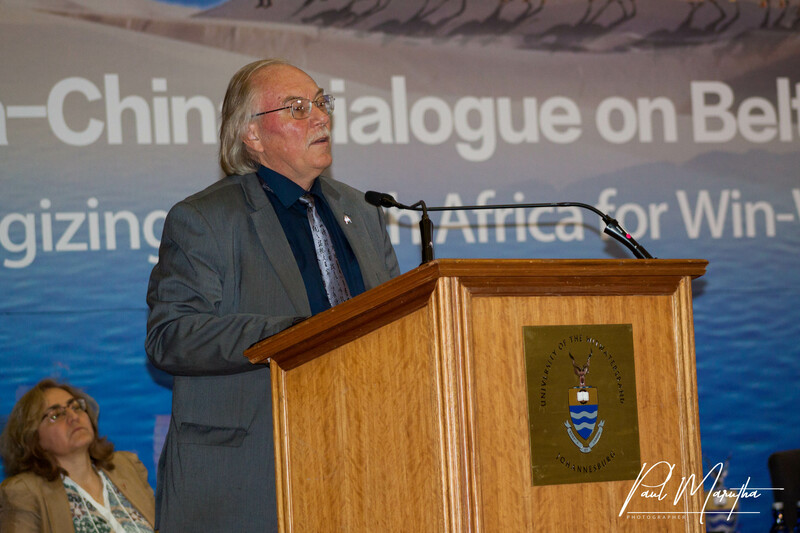 The second session of the conference on perspectives on the BRI was chaired by Professor Philip Harrison, South African Research Chair on Spatial Analysis and City Planning at Wits University. He discussed the BRI’s impact on urbanisation and urban formation across Africa by referencing China’s developmental history as a leading example of rapid progression from rural to urban areas. China is a laboratory in which to look at urban change. Professor Harrison reflected on the common questions that come up under the discussion of the BRI, namely regarding development, governance, planning, and the full impact of the BRI. 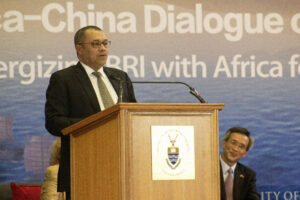 He stated that the BRI conference and Wits platforms such as the Africa-China Reporting Project, the African Centre for Chinese Studies, and other initiatives including SAIIA, DIRCO, and the Chinese Embassy were bridging tools for the questions on the BRI, and a process of understanding the BRI through dialogue was being enabled. He said the second session would introduce some of the vast dimensions in the BRI, including interventions and case studies. Professor Fan Deshang, International Business School, Beijing Foreign Studies University, discussed the cultivation of young talent in the changing world of the BRI. He stated that in the past two years, Peking University (PKU) along with Princeton University and the International Institute for Applied Systems Analysis (IIASA) had facilitated three international joint postdoctoral fellowship programmes to cultivate top performing young researchers in BRI research and data science. In 2018 further fellowship programmes on global issues and the challenges of poverty, water and the environment were supported. In conclusion, Professor Fan said the success of the BRI can be further advanced through the cultivation of young people in Africa and South Africa through research institutions and businesses. Dr Funeka Yazini April, Research Specialist at the Human Sciences Research Council Africa Institute, presented a BRI case study on China’s air industry cooperation with Africa. Since 2013 with the development of the BRI, the expansion of air routes and air transport has become one of the main priorities in China. In 2015 an Africa-China Infrastructure MOU was signed by former African Union Chairperson, Dr Nkosazana Dlamini-Zuma, and Mr Zhang Ming, the vice Foreign Minister of China. The focus of the MOU was on transport, high speed rail, aviation and road highways, among other continental infrastructure development growth agreements. 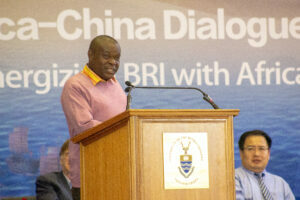 Asssessing the China-African Union Aviation Agreement, Dr Yazini April used the theory of pragmatism, i.e. the alignment of foreign policy with economic development interests. She posed two questions, firstly whether the BRI could ‘fast-track’ aviation on the African continent, and if so to what benefit; and secondly what the aviation cooperation process meant in terms of pragmatism from a continental perspective, and whether it was compromising the sovereignty of Africa or not. With the fourth industrial revolution at our doorstep, global interconnectedness is non-negotiable. In reference to the first question, Dr Yazini April considered the background and capacity of China and Africa. 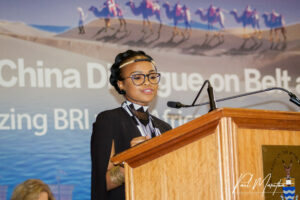 She stated that China had already signed aviation corporation agreements with at least 12 countries. A number of airports were being refurbished in African countries, as is the case of Ethiopia and Botswana. Further to this was the extensive training provided by China to over 500 aviation personnel from Africa annually. With regards to capacity, Dr Yazini April outlined the highly extensive operational costs required in the building and maintaining of the aviation industry, for example costing approximately US$38 million to build one aircraft. Dr Yazini April added that China had the necessary capacity as it was one of the few countries to develop and deliver aircraft with thousands of orders from domestic and international airline buyers. Addressing the question of the practical implications for the aviation industry in terms of pragmatism from a continental perspective, Dr Yazini April assessed the sovereignty from regional AU member states and within bilateral agreements. With the understanding that sovereignty meant the ability of a state to maximize its economic interests without disadvantaging its nation or region, she asked whether the BRI would benefit the national and regional aviation development as per the theory of pragmatism, considering that the AU member states exercised their joint statehood to assess the benefits of the aviation agreement aligning it with the AU Agenda 2063. And that by launching the Single African Air Transport Market to address aviation challenges, the AU strengthened its position. From the bilateral examples, Dr Yazini April referenced Senegal’s and Botswana’s aviation agreements with China and stated that they presented growth and development of the nations without compromise. 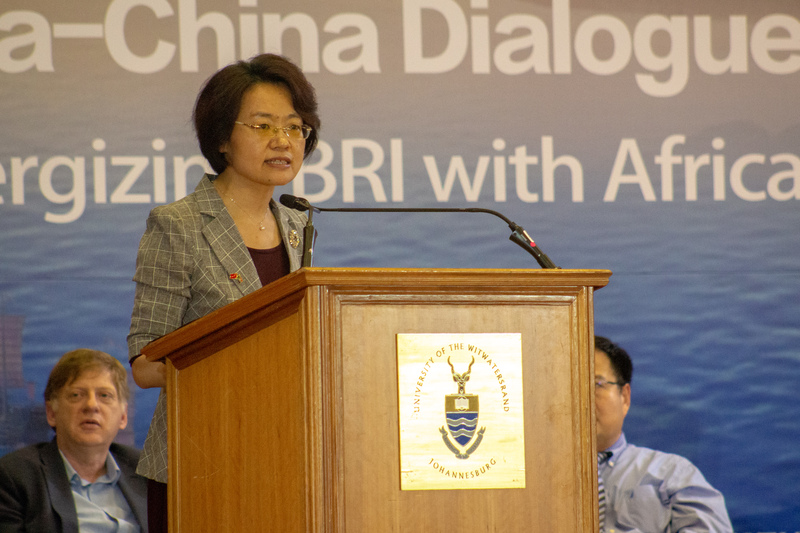 Dr Yazini April concluded that the BRI could not weaken African regional and national statehood, referencing the Beijing Action Plan 2019-2021 for China’s support to Africa’s development of a single African air transport market. Furthermore the BRI aligned with Agenda 2063 and could serve as a supporting tool for development for Africa to change its narrative not only with China but within the international arena at large. Professor Liu Haifang, Director, Centre for African Studies, School of International Studies, Peking University began by addressing the questions of Africa’s inclusiveness and representation in the BRI with FOCAC as one of the incremental tools to enhance Africa’s representation within the BRI. Africa’s involvement and inclusion in the BRI was formalized in 2013. BRI has inspired civil society to link up the continent. To link up the continent is not just a dream anymore. 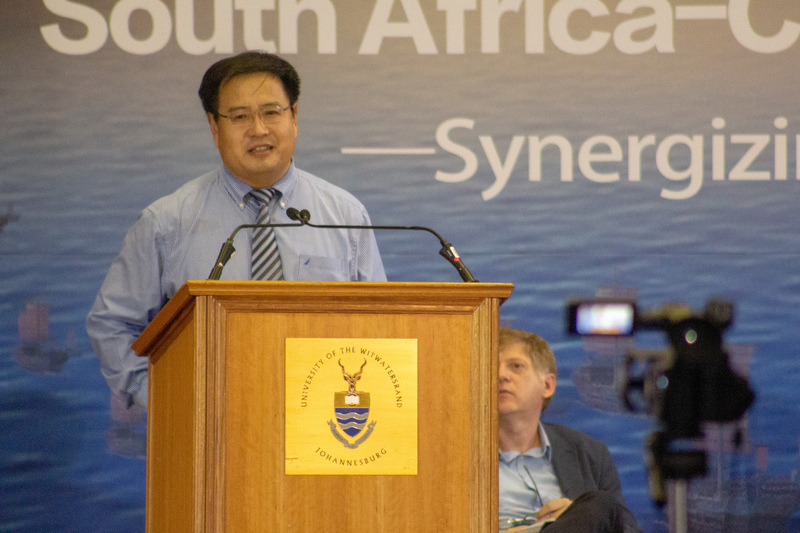 Professor Liu presented findings from fieldwork conducted in March 2018 where two gaps to South Africa-China cooperation were identified. The first gap was that there were cultural and language barriers in people-to-people relations. The second gap identified was the lack of sufficient and qualified human resources to fit into the increasing bilateral investments. 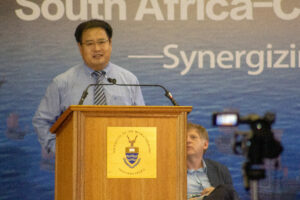 Professor Liu stated that the vocational training in South Africa was not adequate even though it was important to note the developments which had occurred, and that Chinese company surveys found that the hiring of suitable employees was the biggest challenge in South Africa. Professor Liu outlined the digital divide in the African continent as one of Africa’s biggest challenges in the early 1990s, however by the late 1990s the continent, with the assistance of China, was promoting and advancing in the field of digital technology, with the youth leading a number of initiatives. Professor Liu presented the cases of Tanzania and South Africa where ICT infrastructure and initiatives for the youth have been established to promote the livelihoods of society and economic development. Other Chinese initiatives for youth included agriculture where success stories such as the Litenga Indigenous Model were observed. Professor Liu emphasized the vital importance of including the youth in BRI and ICT initiatives for Africa’s and China’s development. Dr Bob Wekesa, Coordinator, Mid-Career Honors Programme, Wits Journalism presented ways to seize opportunities in public diplomacy and soft power along the BRI in Africa. He stated that there was an asymmetric imbalance between the diplomatic and academic formations in Africa-China relations, and that there was immense advancement in diplomacy which was not supported strongly with academic representations. We need to seize the opportunity that the BRI presents to deepen academic engagement – to balance diplomatic formations with academic formations. Dr Wekesa defined public diplomacy as the means and ways by which states and non-state actors influence or persuade foreign publics with the aim of promoting and achieving goals and interests. He defined soft power as a nation’s strategy to win the hearts and minds of foreign populaces through factors of attractions such as culture, values, ideology and institutions. According to Dr Wekesa, the BRI provides an opportunity to study these concepts further and to apply them to international relations. Dr Wekesa considered Africa’s role in the geostrategic plan with regards to the BRI, and the need for upholding African agency where Africa could engage as an actor rather than just being a passive observer. He stated that Agenda 2063 could be Africa’s starting point, particularly aspiration 2 of Africa as an integrated continent, and the first 10-year plan and its infrastructure plans. Panelists engaged in a QnA session where the audience drew further comments on global economic and governance concerns regarding the BRI. 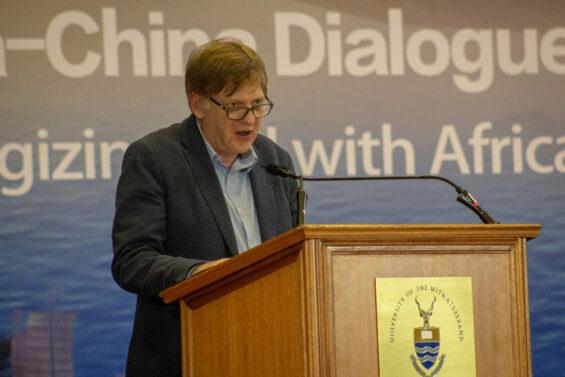 Closing remarks were presented by Dr Cobus van Staden, Senior Researcher: China-Africa, South African Institute of International Affairs (SAIIA) and Bongiwe Tutu, Assistant Project Coordinator, Africa-China Reporting Project, Wits University. Discussions and closing remarks and publications can be viewed in full below.